Colorful Eggs You Can Fill, Click Close and Hide! 12 bags with 12 eggs per bag. 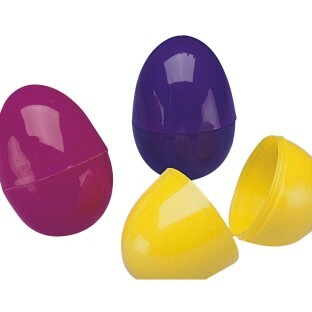 I used these eggs as a craft in our Vacation Bible School to make musical egg shakers. Just fill them half-full with rice. Add the new thin 3/4 wide decorative duct tape to be sure they stay closed and voila! an egg shaker musical instrument! I was glad to find them in the summer time.